Last week I went to Elfriede’s Fine Fabrics in Boulder and had an unintentional fabric buying extravaganza! My patient husband just sat at a table and worked on his iPad, while the bolts were stacking up for cutting. If you have never been to Elfriede’s you are missing out on one of the great independent fabric stores that are too few already. She specializes in high-end natural fibers like liberty cottons, luscious silks, gorgeous wools, camel hair, cashmere, high quality knits and a small but wonderful selection of quilting cottons. Next fall I need a raincoat for my trip to Paris. Colorado is rainy this spring so making the coat now makes sense. 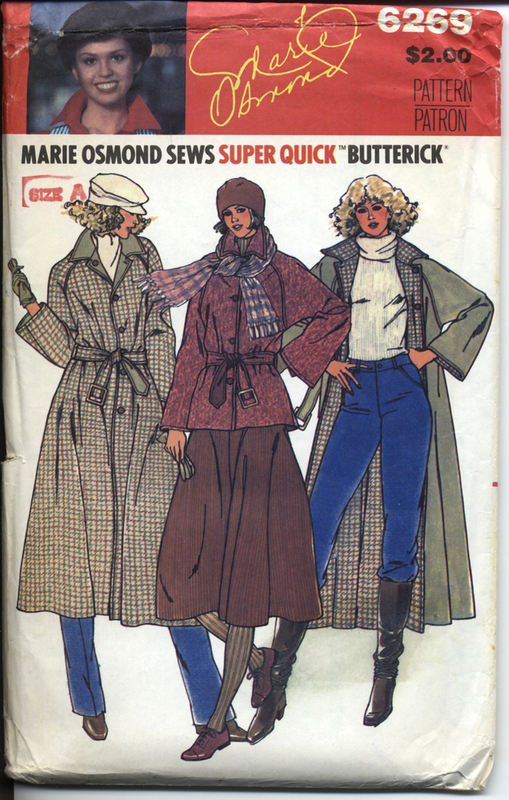 I had already picked out a vintage pattern that was reversible so I could have a raincoat on one side and wool on the other. 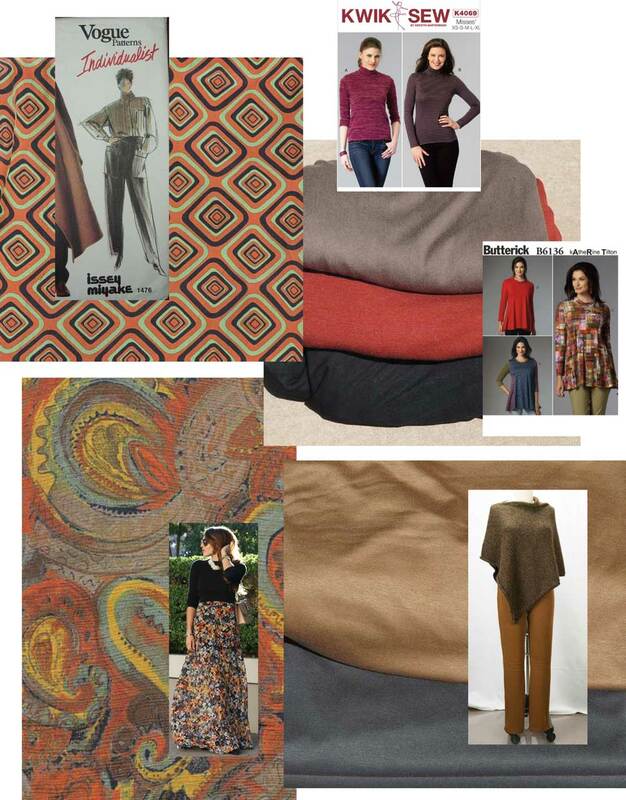 A Marie Osmond pattern…I have no shame when it comes to getting the look I want! The helpful saleswomen convinced me that a tightly woven wool would do the trick rather than an actual raincoat fabric. I know I can waterproof the fabric if need be. The only problem is that Elfriede’s Fabrics had too many gorgeous wools to pick from. After narrowing it down to about 10 bolts(! ), I told them I couldn’t decide and just wanted to browse around the store to clear my head. That’s when I found this rayon paisley fabric that was perfect for me. My colors: orange, brown, olive & black plus a few interesting accent tones like mustard and a grayish teal blue sealed the deal. It was instant love! 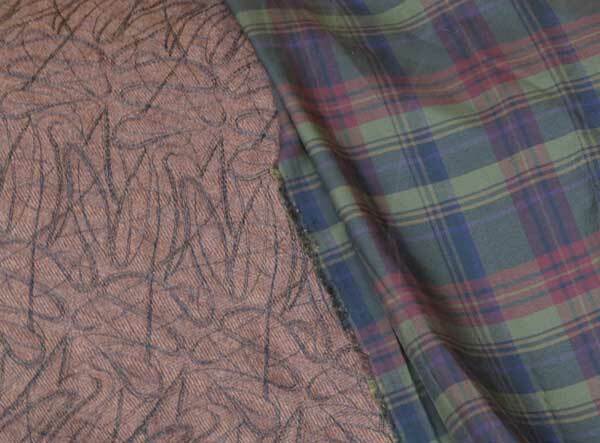 I plan on making a maxi skirt (with a lovely blue lining) and will use the scraps to make a scarf. Without intention, a capsule wardrobe was developing on the cutting table. I asked about bottom weight knits for some pants. Again, they pulled some out and it was easy to choose. I’m not sure if your computer is showing the colors correctly but these two stable bottom weight knits look great in the ensemble. The grey has a blue cast that looks wonderful with the print above. All of us are having fun at this point and the saleswomen start pulling out more things for me to choose from. I picked this silk charmeuse for a blouse. At their suggestion, I’m going to sew it with the matte side out so it’s a little less dressy. At this point another employee, Melissa, stopped in and I discovered she had made a shirt I admired in the window. It was a pattern that I owned, but had never noticed the shirt. 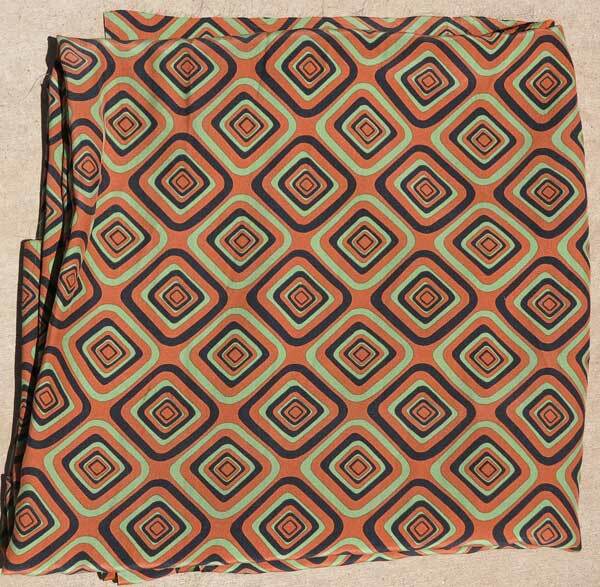 Why stop now?, I thought as I spied one last spectacular fabric. 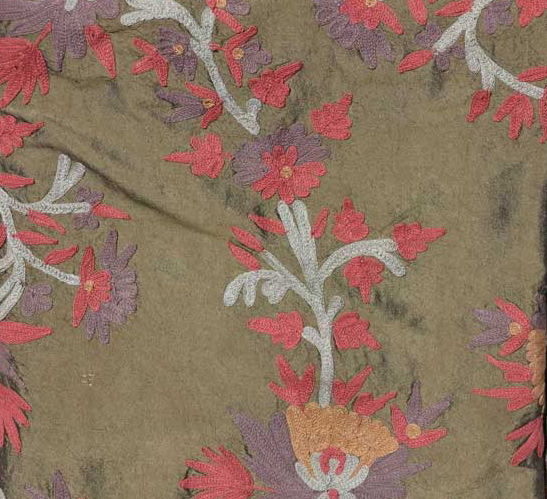 An olive-green embroidered silk. 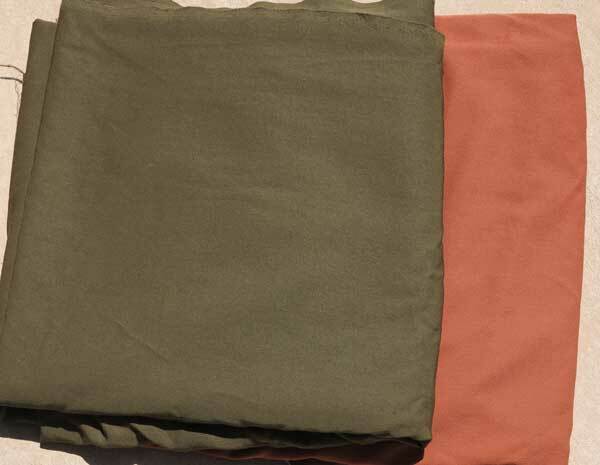 Not an everyday fabric, or could it be if made into a vest with casual details? I have a pattern like that at home! 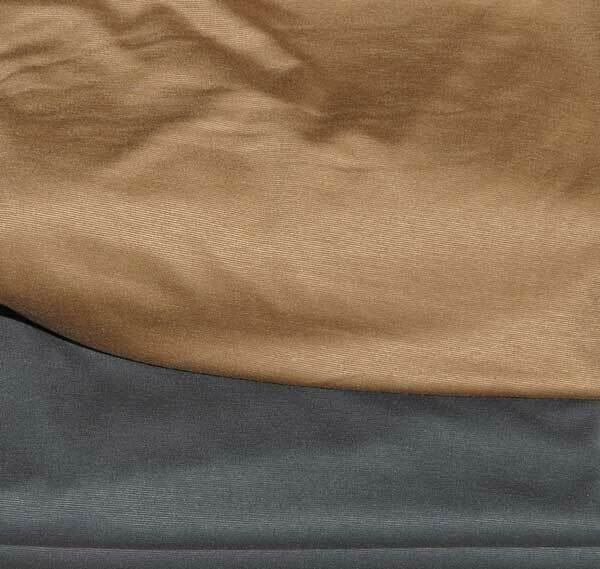 I mean this is basically khaki green isn’t it? 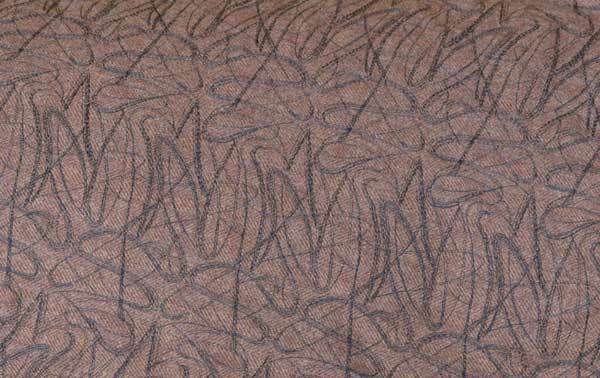 An embroidered safari style vest would be very wearable, but have a little pizzazz in this fabric. I’ll figure out a better solution for those stringy things. The coat twist story: I couldn’t figure out what size to make the coat. My measurements said a size 16 and that just didn’t seem right. I decided to take a wool in my stash to make a wearable muslin. I can always make it shorter than the intended raincoat. 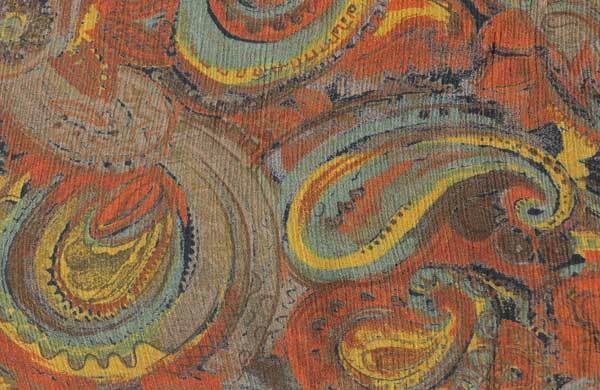 This fabric also came from Elfriede’s but I also saw it a week later on Marcy Tilton’s site. Elfriede and Marcy both love quality fabrics! The muslin (size 12) is going so well that I looked in my stash for the reverse side and found this gorgeous silk plaid that I was saving for a shirt. Yummy! The problem is, do I even need the originally planned coat? 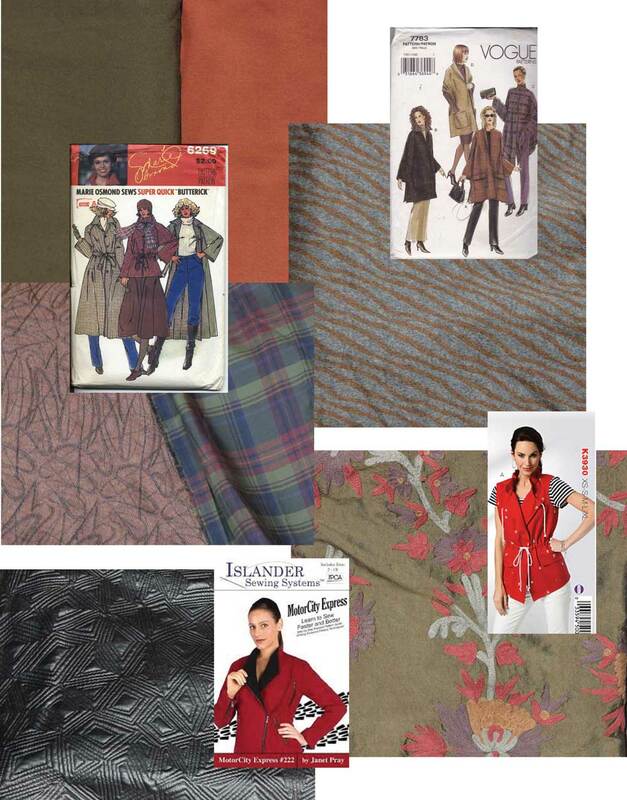 Time will tell, but as a summary, I’m including two mood boards I made on Adobe illustrator with the above fabrics, the two coat options, and some additional textiles from my stash. A large portion of these items will go to Paris with me. I’m way ahead of my fall planning, but after all it is my favorite season. Notes: The zebraesque striped cashmere/wool is yummy soft and came from EmmaOneSock.com. A poncho or ruana is always a practical addition to my fall wardrobe. The hip black plastic coated knit (no longer available) is from MarcyTilton.com and should make a great motorcycle jacket. 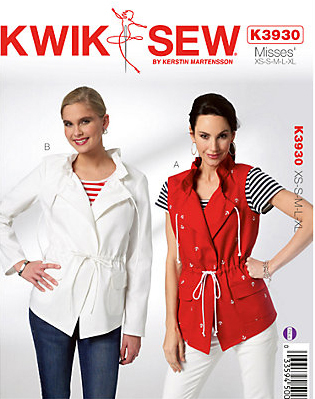 The pant pattern is Marcy Tilton’s slim pant Vogue 8859. I’m back! I’ve been sewing whenever I can, but I’ve had no time to blog. Love, love, love this dress. I found the fabric on Marcy Tilton’s site and ordered two repeats immediately! Good thing since it was gone the next time I looked. It’s a digital print on the softest piece of medium-light weight french terry. Seriously, french terry…I could wear this dress to the beach and then a dinner party and not skip a beat. Yes it shows my dreaded arms, but my BSF has convinced me that it gets too hot to always cover up. I might make a little cover up jacket for cool evenings with Marcy’s Vogue 9081 pattern, but I hate to cover up the statue that is peeking out on my left shoulder. The pattern is self drafted from a knit dress I own, and then I modified it to have cap sleeves to protect my pale shoulders. 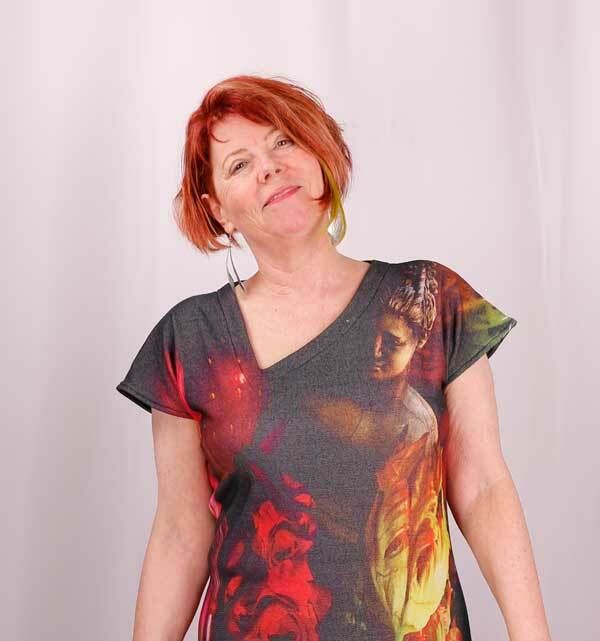 The other modification is the asymmetrical neckline that helps emphasize Venus on my shoulder. Venus ended up on my left shoulder on the back too! My husband and I planned on visiting his mom Joan last week. Unfortunately, I ended up sick and had to postpone the trip. Joan, this is in the mail for you, so the post will be a surprise before the present! I’m at my BSF’s house complaining that I just can’t find the perfect spring fabric for this purse. 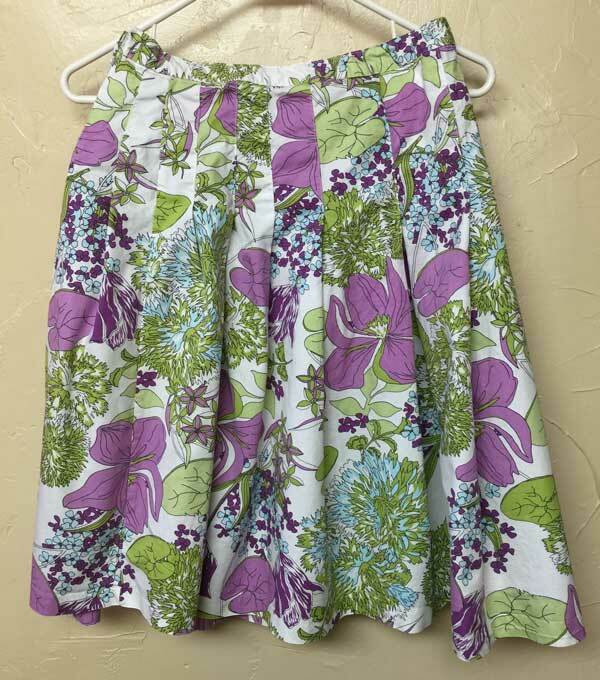 I turn around in her sewing room, see this skirt hanging up and exclaim, “something like that!” Since Debra was using this thrift shop skirt for a refashion to fit her little granddaughter, she gave me a panel. Basically this is just a full length skirt panel that I lined. Then I added the gathering to the wide part (the hem). So the width worked with side seams. 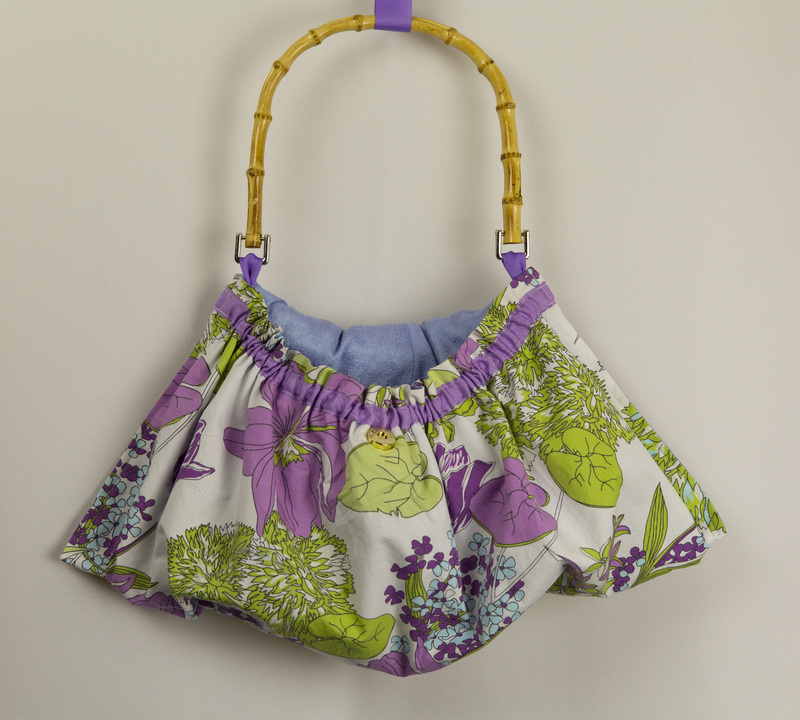 Before closing it all up just add a snap, any embellishments, and voilà, a cute special occasion purse! 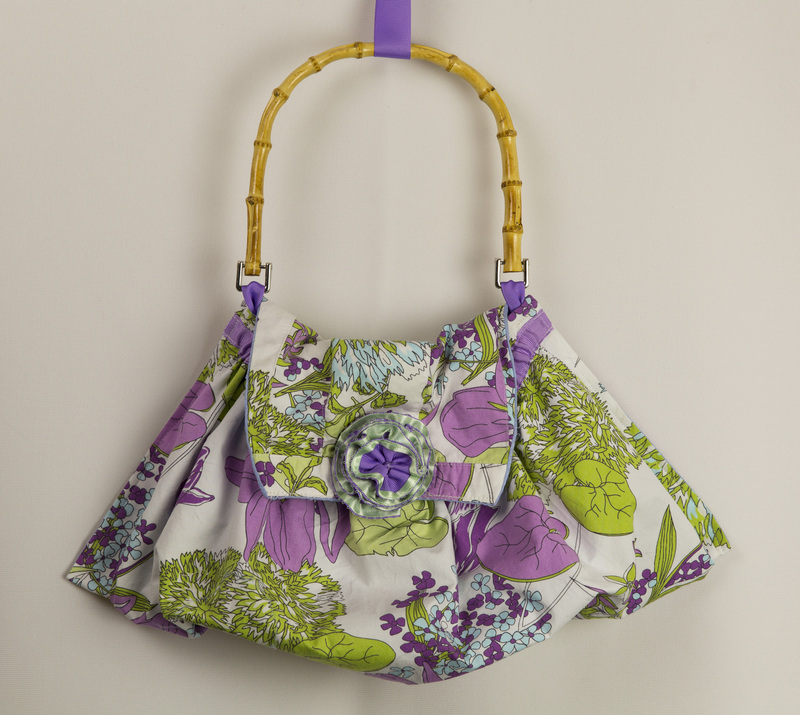 As an aside, a fellow blogger made a nice courier bag with a leather skirt, the same week as I was making this purse. Check out the post here.